The $13 bln bank’s Japanese advisory arm had a blowout year, a bright spot in otherwise dismal earnings, thanks to mandates for SoftBank and Takeda. Yet cost cuts abroad, uncertainty around deals like Toshiba Memory's IPO and an apparent snub by Japan Post could tarnish 2019. The Japanese group is putting $1 bln into the under-fire fintech firm. Unlike some of SoftBank’s flightier deals, this will be done with convertible debt. Wirecard gets validation from a respected backer, which gets a disruptor on the cheap without taking upfront equity risk. The Japanese carmaker slashed its forecast annual operating income almost one third, a second cut in months. It blames warranty costs, weak sales, and the fracas over its ex-chairman. New woes make it harder for boss Hiroto Saikawa to steer through old ones. The Japanese brand is paying $2.7 bln for DuluxGroup, sending its Australian peer’s shares to record highs. The hefty premium reflects a shortage of targets and the buyer’s eagerness for expansion. Given a cooling economy Down Under, it may have been better to keep the brush dry. An investor group is buying two thirds of Japan Display for $714 mln, an embarrassingly low price for a former national champion. The company will fall into foreign hands, some of them Chinese, which could raise red flags. Managers have little choice but to pray the deal closes. The activist’s return to the $60 bln PlayStation-maker provides a catalyst to break the company into a pure-play chips business and a more-focused entertainment group coveted by Apple, Amazon and Netflix. By exiting phones and selling insurance, it can also better compete. The postal operator is offloading $3.5 bln of Japan Post Insurance stock. It gives funds to a seller known for dubious M&A. Investors are offered a company at a cheaper valuation and in better health than when this fiddly privatisation process kicked off in 2015. That’s how much more the state’s stake in the carmarker could be worth if the discount at which the company is trading disappears. Mending Nissan relations is a precondition. Paris may only do the minimum to help former CEO Carlos Ghosn, who has called for the government’s help. The ailing Japanese bank will cut $1 bln of costs after enacting an identically sized plan in 2012. All the “right-sizing” and “simplification” is needed, but investors will be forgiven any eye-rolling. 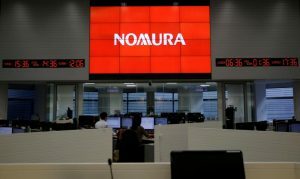 At least Nomura is bound to have European company in its restructuring misery. The $170 bln Japanese automaker will open some 24,000 hybrid-related patents to rivals. Such technology may be headed for obsolescence as policymakers push for even cleaner options. For now, Toyota puts itself in better position to navigate the tortuous road to electrification. The carmaker is in demand. Already the subject of interest from Peugeot, it could also face a bid from a merged Renault-Nissan, the FT says. Such a deal would be tricky and take time. But patience could give the Agnelli clan better options to solve FCA’s tech and Asian headaches. Weak economic activity is raising the chances of the European Central Bank copying its Japanese counterpart, which has kept rates ultra-low for two decades and adopted ever more radical measures to boost inflation. Lenders in Japan show European peers the heavy toll that takes. The U.S. private equity firm is making its Japan LBO debut by acquiring drugmaker Ayumi for $1 bln. It is a retread already owned by two local buyout shops. The government’s newly introduced price controls could squeeze smaller peers, however, and give a rollup strategy a shot. In a rare act of corporate aggression, trading house Itochu snatched a degree of control over $1.8 bln sportswear maker Descente. Toshiba faces an investor revolt, while Alps Alpine has been sued over governance. Japan’s structural reforms are faster finding their targets.